Refurbishment of aging electrical infrastructure, development of new distribution network with increasing investment in power distribution sector as well as rising investment in renewable energy sector would boost the demand for recloser & load break switch in Europe. Additionally, increasing investment to build industrial infrastructure by several countries is also strengthening the demand for Load Break Switch and Recloser in Europe. According to 6Wresearch, Europe load break switch and recloser market size is projected to grow at a CAGR of 3.0% and 3.4%, respectively during 2018-24. To integrate the energy market and to meet the energy and climate goals, the European Commission has estimated that around €200 billion is needed during the current decade for transmission grids and gas pipeline which would ultimately drive the demand for recloser and load break switches during the forecast period. Additionally, due to growing environmental concerns, countries such as Russia, UK and Germany are trying to increase their renewable power generation capacity. Russia has set a target to increase renewable share up to 11.3% from the existing capacity of 3.6%, by the end of the year 2030 while U.K is aiming to achieve final energy consumption of 15% through renewable sources by 2020, which is further likely to drive the Europe load break switch and recloser market over the next six years. 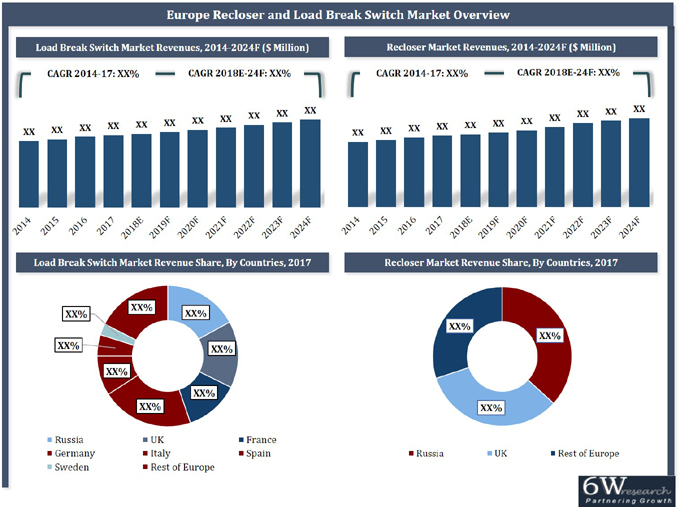 In Europe, gas insulated (SF6) load break switch and recloser held the highest Europe load break switch and recloser market share and would continue to dominate over the coming years. This growth is primarily due certain key features such as better cooling effect and heavy built. The Europe load break switch and recloser market report comprehensively covers the Europe Load Break Switch & Recloser Market by voltage types, insulation types, applications, end users and countries. The Europe load break switch and recloser market outlook report provides an unbiased and detailed analysis of the Europe load break switch and recloser market trends, opportunities/high growth areas and market drivers which would help the stakeholders to device and align their market strategies according to the current and future market dynamics.